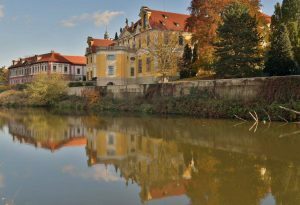 In the vicinity of the city of Prague, a village called Zbraslav was founded and became royal property. From 1292 onwards, the royal estate was administered by Cistercian monks, to whom King Wenceslas II donated the estate and decreed the royal burial place to be at Zbraslav. On July 3, 1297, the foundations of a new monastery and cathedral were laid. After the violent death of Wenceslas III, its rare jewels were stolen and under the reign of Hendry of Carinthia, the estate was partly plundered. 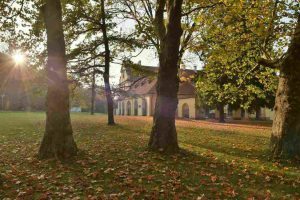 At that time the monastery was headed by the first Abbot of Zbraslav Konrád. Petr Žitavský, author of an outstanding chronicle, was elected his successor 1316-1339. The monastery was favored particularly by the House of Premyslids and later by the House of Luxemburg. Queen Eliška had the Marian cathedral, unfinished for 22 years, completed and was buried there in 1330. Aeneas Sylvius Piccolomini, who was later to become Pope Pius II, mentions in his Czech chronicle the completion of the expensive monastery water pipelines. At that time the Zbraslav monastery was already deteriorating. The beginnings of the Hussite storms brought to an end the famous era of this monastery. ON July 10, 1420 it was looted by the rebellious people of Prague. The royal tombs were also destroyed. Later, Abbot Jan (1415-1424) had the scattered remains collected and saved a precious relic – a painting of the Zbraslav Madonna, which used to adorn the Marian Cathedral. During the Thirty Years War the monastery was partly destroyed by fire and its destruction was completed in 1645. Under Abbot Jakub Martini (1650-1654) the Church of St. Jacob was enlarged. It was not until the beginning of the 18th century that Abbot Lochner directed the construction of a new monastery, designed by the famous architect Giovanni Santini Aich. On the latter´s death the construction was entrusted to František Maxmilián Kaňka in 1724, who in turn called in Václav Vavřinec Reiner, František X. Balka and sculptor T. Soldati to decorate the halls. The monastery was completed in 1732 and had the appearance of a three-winged castle with a court at the centre. One of the guests was Empress Maria Theresa in 1743. 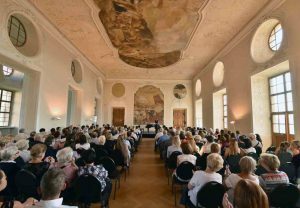 Paintings by the outstanding artists Brandl and Škréta were acquired for the monastery by Desiderious D. Anders. The last abbot was Celestin Story. After his death the monastery was abolished by Emperor Joseph II even though he confirmed all its privileges in 1783 by imperial decree. In 1825 the prelature and estate was gained by Bedřích of Oettingen-Wallerstein. 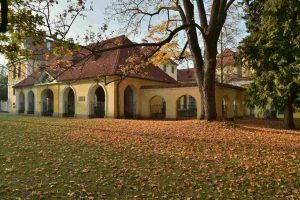 In 1835 Duke Bedřich founded here the first industrial school. The last owner – Cyrill Bartoň of Dobenin – had all the buildings restored in 1912-1925, thus historical Zbraslav was saved and raised to its original beauty. Since 1939 on the basis of the contract, the National Gallery in Prague installed a collection of Czech sculptures. In 1948, the chateau’s buildings and equipment were confiscated by the state. In the later years, the object, along with the artistic inventory, was mainly used for the official purposes of ministries. The castle was returned to Barton of Dobenin in restitution and part of the space is currently used as a depository of the library of the National Museum. 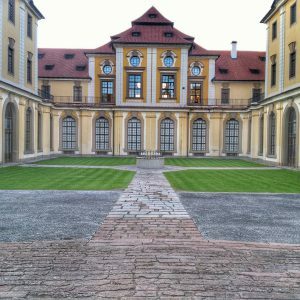 Návštěvní hodiny parku každý den od 6 do 18 hod.